This is the most well known of all different fictitious parts of an Astrological Portrait that is known as Parts or Arabian Points. Calculations of the Lot or Part of Fortune, is based on the position of the Sun, the Moon and the Ascendant. It is considered that these three energies are quite important for men and they exert such a quiet great influence over one's personality. The Sun symbolizes its identity and its conscious objectives; the Moon represents the emotional side, as well as the subconscious and/or unconscious parts; while the Ascendant, with a visible personality, expresses in some way the Sun and the Moon as personality factors. 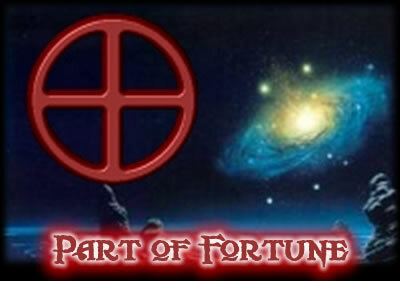 The relationship between these three elements is called pars fortunae, Part of Fortune. This sensible point shows the place in the Astrological Portrait, where the Sun, the Moon and the Ascendant can meet in the most congruent way. Hence, it shows the sphere of life in which we better can achieve true happiness( the sign tells us "Why" and the corresponding house tells us "Where") it shows the place where our hidden treasure is, our future. to find out your Part of Fortune.